(CNN) -- General Motors' outgoing chief executive Rick Wagoner is eligible to receive more than $20 million in his retirement package, according to a filing with the Securities and Exchange Commission. Rick Wagoner, who became CEO of General Motors in 2000, announced his resignation Monday. 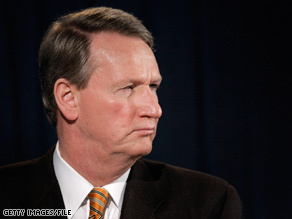 Although Wagoner is not eligible for any severance pay upon leaving GM, he is eligible for hefty retirement benefits. "He has worked for GM for nearly 32 years, and he would be entitled to certain vested awards, deferred compensation, and pension and other post-retirement benefits," GM said in a statement. Upon Wagoner's departure he will be eligible for both a salaried retirement plan and an executive retirement plan, which at the end of last year totaled approximately $20.2 million, GM spokeswoman Julie Gibson said. Most of it would be paid out as an annuity over five years, with the remainder as a small lifetime annuity, Gibson said. Wagoner hasn't yet officially left the company and has not received any of the retirement compensation. What will actually be paid to him is still being reviewed, GM said. Paul Hodgson, senior research associate at The Corporate Library, which analyzes corporate governance and pay, said if Wagoner is contractually entitled to the compensation, GM couldn't insist on withholding it. Wagoner will not comment on the matter, Gibson said. The United Auto Workers also said it had no comment on Wagoner's compensation. Wagoner said late last year he would accept a $1 annual salary if the federal government would come through with billions of dollars in loans for GM. The loans came, and Wagoner's $1 salary commenced January 1, according to a filing with the SEC. The federal government has loaned $13.4 billion to GM and $4 billion to fellow struggling automaker Chrysler, and on Monday, President Obama gave failing grades to both companies for their turnaround efforts. He said the government would give GM "adequate working capital" over the next 60 days, during which GM must prove it can "restructure in a way that would justify an investment of additional taxpayer dollars." Chrysler will be given adequate capital to continue operations for 30 days while completing a merger with Fiat. Wagoner became CEO of GM in 2000. Before that, he was chief operating officer and led the company's North American operations. He also served as chief financial officer from 1992 to 1994. CNN's Ekin Middleton and CNNMoney.com's Peter Valdes-Dapena contributed to this report.